We had a couple plays that we tagged in Friday morning’s premarket report that went on to provide traders with a good chance at some intraday gains. SkyPeople Fruit Juice, Inc. SPU - We put SPU on watch after noticing the strong session it recorded on Thursday, and the momentum carryover was pretty impressive. From an early low of 4.35, took of and hit a high of 7.90. That worked out to an intraday jump of 82% which came on over 17X the 3-month average volume. MaxSound Corp. MAXD - Also performing well was MAXD, which we tracked over an impressive range from the .002′s to the .008′s back in early April. We circled back around to it at an opportune time on Friday, as the stock launched from .0043 on up to .0064, logging a 49% pop on the day. 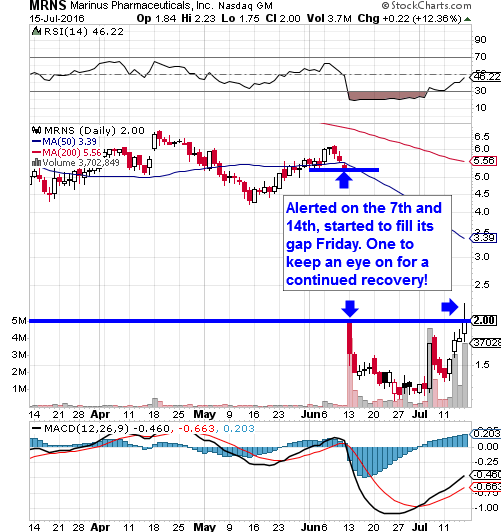 We want to give our readers a quick reminder on MRNS this morning, a stock we recently tagged with the intent of seeing it try to fill the massive gap on the chart. After seeing 1.35 following that alert, the stock began to do just that as it hit a high of 2.23 on Friday. That’s a 65% run-up so far, and we’re going to be very interested to see how the activity unfolds as we kick off this new trading week. 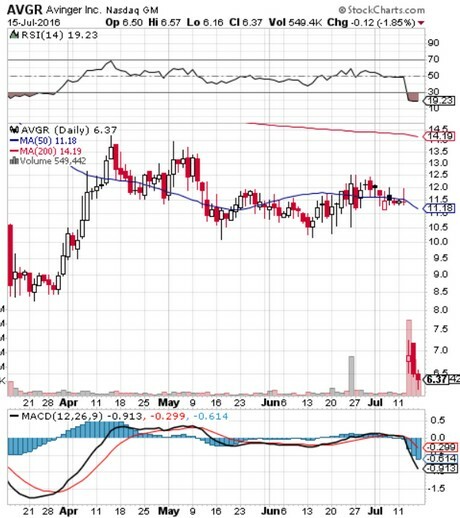 Speaking of stocks with enormous gaps to fill on their charts, we also want to begin monitoring AVGR, which, as you can see on the snapshot below, is in a position similar to that of MRNS when we began tracking it a couple weeks back. The stock is searching for a bottom after taking a massive gut punch in the form of a three-dollar gap-down. While it appears it may yet have some bottoming out to do, it’s egregiously oversold at the moment, and we’ll want to be there when its own recovery begins as the resulting rebound could carry some substantial gain opportunities along with it.